No, this has nothing to do with track bikes. On the contrary, on the track everything is comfy, clean and smooth, while cyclocross is cold, dirty, muddy and rough. The thing that they have in common is fun! I started a classic cyclocross project more than a year ago by purchasing an old Alan Super cyclocross frame. I've made it ready to ride for a classic road ride last September, but now it's time for the next steps: make it offroad ready. The indexed Shimano bar end shifter has to go and to be replaced by a Suntour. The large 48T ring has been replaced by a 44T. And most important: knobbly tyres. Until the late 1990s, when Michelin introduced the Wildgripper Sprints, there were no good clinchers for 'cross, so you had to ride with tubulars. Many years before André Dugast came up with his superior line of CX tubs, people had to ride Clément Grifo, which was the best and the standard. Of course, there were alternatives, like Wolber, Barum, and several (other) eastern European products. Wolber was available, affordable and more or less good quality. It couldn't compete with Clément, but for touring, training and racing, it was good enough for less wealthy people. Cross 28 has a Grifo-like "tractor" tread, which is good for 80 to 90% of all terrains. Cross section is a bit skinny, but because the canvas is not that supple and the inner tube is Butyl, a wider tyre would be almost impossible to ride. In the 1980s, 28 mm was quite normal. 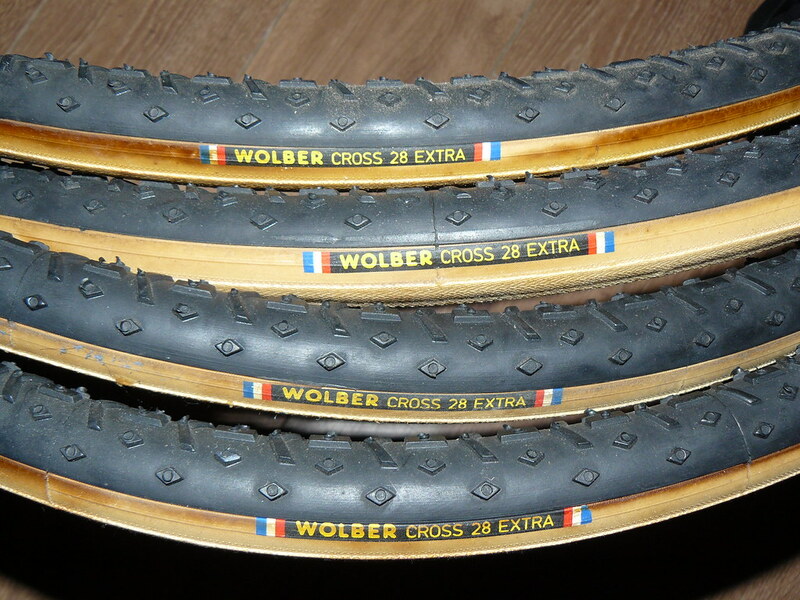 Besides the Cross 28 extra, Wolber also had a more heavy duty Cross Super with round studs tread and was called Cross Super. Even skinnier at 25.5 mm and suitable for muck and snow.